I enjoy other people’s typos, not in a gloating sense, but in the sense that it lets me know I am not alone. I keyboard fast and make a lot of typoes. (Yes, that was deliberate. Just checking to see if you’re tracking.) I probably spend 20 percent of my keyboard time backing up to make corrections. Despite my diligence, occasionally a typo or another error slips through in a column, which is why I live in constant fear of retired English teachers. They are the first to email. They can never completely let go of the red pen. The best errors are in the closed captions on the televisions at the gym. I’m the one on a treadmill simultaneously sweating and laughing at the news. A recent favorite was in a story about a man giving an organ concert. He demonstrated how the massive pipe organ could sound like an entire orchestra. The closed captioning had the man saying, “This sound imitates a fluke.” That was a whale of a claim. The New York Times was mentioned for hiring a new conservative writer and the closed caption read: “The NYT reserves credit for broadening their left-wing op-ed page.” They probably “deserve” credit, but why don’t we hold that in reserve until we see how long the writer lasts? Some of the best glitches are in the weather reports. “Stay tuned, we’ll have weather in a bed.” They probably meant “weather in a bit,” but who knows. Even the weather gets sultry sometimes. In another weather segment, a meteorologist promised, “milder weather with swiss temperatures.” I have no idea what that was supposed to be. I checked my weather app and it turned out the Swiss were having the same temperatures we were having but with less humidity. Guess we weren’t missing (or swissing) out on as much as I thought. Reporting on an accident on the interstate, the caption said, “Traffic has resumed posted speech patterns.” When drivers I see engage in speech it’s usually a pattern involving hand signals. I’d like to see “No Speeching” signs posted. A woman charged with a crime was shown being led to an arraignment with a caption below that said, “Purple walk.” It was a perp walk—and she was wearing orange, not purple. The caption in a story about a high school athlete who collapsed on a field said, “Nurses and people in the stands rushed to give the boy first aid so he could keep breeding.” I’m 99.9 percent sure they meant breathing. The young man is fine. A reporter was talking about getting ready for a marathon by eating a lot of spaghetti and pasta. The caption beneath him said, “There’s no need to stuff your face to the point of car bloating.” Who hasn’t eaten so many carbs that you felt like an SUV? An ESPN closed caption read: “Authorities gave Tiger Woods some field and bright tests after finding him asleep behind the wheel.” It probably meant to say field sobriety tests, but if you suspect someone is under the influence and driving it never hurts to check how bright they are as well. 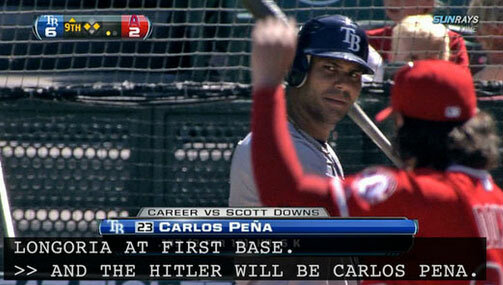 I don’t know if it means anything or not, but most of the closed captioning errors are made on Mundays. I asked our four-year-old granddaughter about her family’s recent visit with friends. “It was good,” she said. “That’s too bad. Did you fork her back?” I asked. Stunning, isn’t it? A four-year-old understands the value of restraint more than a lot of adults. An eye for an eye, a tooth for a tooth, a fork for a fork—it never ends well. She said it partly in jest, but not entirely. No, we were not mad at each other, but many in our nation are mad. Actually, they are beyond mad—they are enraged, furious and seething. And these days many of us seem utterly incapable of holding anything back. It’s as though we are compelled by some irresistible force to say, post, tweet and scream every rotten thing we think. Is this really who we are? Is this really who we want to be? Dozens of columns will probably be published this week documenting the slippery slope we’re on, with calls to scale back the rhetoric. Well, we can start by turning down the heat one person at a time and one insult at a time. For starters, we could all give ourselves permission not to say everything we think. It’s OK to bite your tongue sometimes. And to keep your fists at your side. It’s called self-control. Second, we can turn down the volume. Screaming has never been an effective means of persuasion. Third, we can get real. As long as this country has existed there have been disagreements. We will always have disagreements. Aside from the Civil War, national disagreements have largely been resolved without resorting to violence or lethal hatred. Our disagreements may be intense and passionate, but they can still be civil. If you have a disagreement, go after the idea, the policy or the legislation, not the person. Learn how to structure valid arguments and stop the name calling. If we do not detox ourselves soon, we will cease to be a nation ruled by laws and become a nation ripe for anarchy. The day after the nation was horrified by an unhinged man attempting to assassinate Republican congressmen on a ballfield in Alexandria, Virginia, there were three organized prayer meetings on the Hill and numerous spontaneous ones. Each one of us can pray, too. We can pray for God’s mercy on our nation, for temperance, wisdom, prudence, and the ability to love our neighbors as ourselves. Finally, we can pray our nation does not succumb to being a people who relish repaying evil with evil. I was one of those mothers who believed that every moment was a potentially teachable moment. Not having learned my lesson the first time around, I continue exercising my somewhat misguided beliefs with our grands. Since a number of them enjoy painting, I thought we might do some intentional painting instead of just slinging paint on paper, the table and chairs and the walls like we usually do. So we had art camp. It was more like art afternoon and camp was in the kitchen, but I was full-bore intentional. I dug up a wonderful children’s book on the American painter Georgia O’Keefe known for bright, bold close-ups of flowers. I found jars to mix water and food coloring in and even scored some canvases on sale. The small painters put on their paint shirts, or emergency clothes as they call them. There is a wild assortment of emergency clothes in a drawer upstairs, which says a lot about what happens at Grandma and Grandpa’s. “I’m going to tell you about an artist named Georgia O’Keefe,” I said. “Did she live long ago?” one asked. The inspiration meter was flat-line. 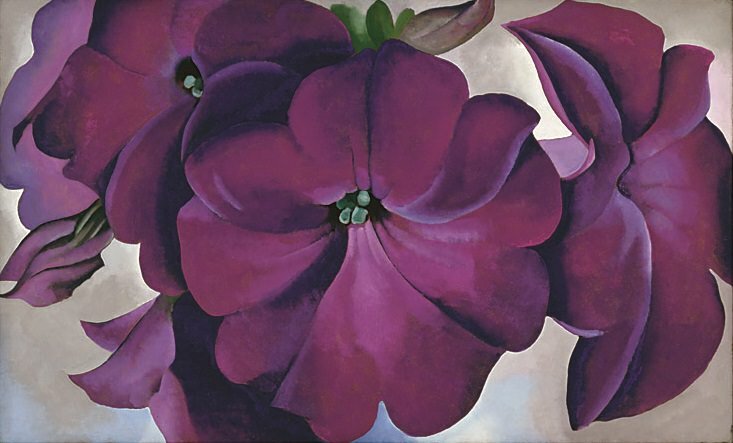 I tried to rebound by showing them O’Keefe’s paintings of eye-popping poppies, rich purple petunias and regal morning glories. “I like that she made the flowers BIG!” said another. “I think you’ve got that one upside down, Grandma,” said the 4-year-old. It wasn’t going the way I envisioned. Life rarely does. They picked flowers from the yard and placed them on the table next to the prints of O’Keefe’s. We talked about layering colors, painting something larger than it is in real life and filling all the space on the canvas. I explained that Georgia worked slowly, perfecting composition and layering colors for weeks and months at a time. They whipped out their paintings in 15 minutes. 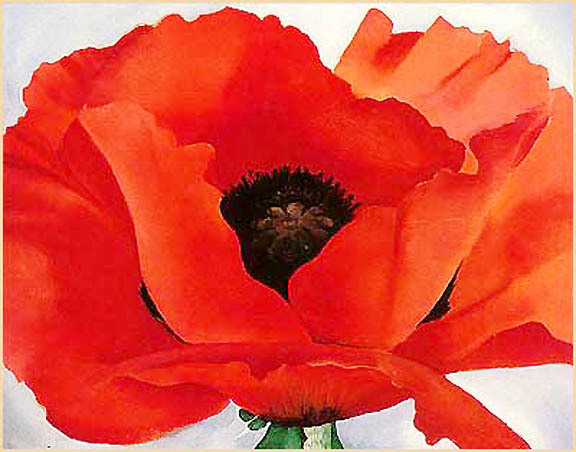 One who had picked a black-eyed Susan to paint looked at her work, looked at an O’Keefe painting, looked back at her work and seemed satisfied. Then she rolled a big old paintbrush in the blob of yellow on her plastic palette and drew a great big sun in the corner of her painting. Then she put a happy face on it. Another one painted a zinnia. She looked at her work, looked at O’Keefe’s and seemed pleased. Then she sat up straight and finished off her piece by painting her name so large it filled the bottom third of the canvas. They may have been implying that O’Keefe had room for improvement. Few things knock me off my game like being ambushed before morning coffee. My attackers are 8 and 6 and ready to seize the day. They are hiding behind a door and nab me on the heels. Literally. I scream. They scream. We all scream. Yet the rest of the house continues sleeping. Or at least pretending. “Aren’t you two up early?” I ask. “Sure am,” I say, propping my eyes open with stir sticks. “I believe it!” I said. After a lengthy itemization of food they’d like me to make for breakfast, it is apparent our best option is Cracker Barrel. Or our second option, which is even better – walking to the grocery for donuts. “Early riser love to walk!” one of them shouts. Of course, I can run. I run every day chasing after their Grandpa with a Honey-Do list. “Early risers love to run,” the younger early riser declares. They decide to run one at a time. He takes off like a shot and she stays behind with me. We come upon a mallard waddling through the heavy dew in a neighbor’s yard. “Catch it and you can keep it,” I tell her, just like I used to tell her dad. She sprints after the duck, gains considerable ground, and the duck takes to the sky. We leave the neighborhood and wind behind a strip mall, past back entrances to a dry cleaner and a pizza place, cardboard boxes that missed the dumpster, a lawn chair used for smoke breaks and a couple of pigeons. They stampede toward the pigeons, which quickly flutter away. “Your pigeons scare a lot easier than ours in Chicago,” surmises the older early riser. “Our pigeons are more flight than fight,” I say. We plan strategy for crossing four lanes of traffic, which is dicey business, but there is virtually no traffic at this hour of the day. We enter the grocery and spend two minutes shy of forever choosing donuts for the non-early-risers back at the house. The agreed-upon favorite is the monster claw, a glazed long-john with chocolate iced fingers at one end. We leave the store and discover the morning sun blasting right into our faces. We shield our eyes, cross the deserted four-lane, walk in front of the strip mall this time and wind back through the neighborhood beneath a canopy of shade trees. They laugh, tell a few funny stories about their mom and dad (the price parents pay for sleeping in) and frequently stop to look at leaves. Their faces radiate curiosity, joy and the fleeting wonder of childhood.